Andrew Newby speaks at the Purple Heart Parking Pass ceremony. 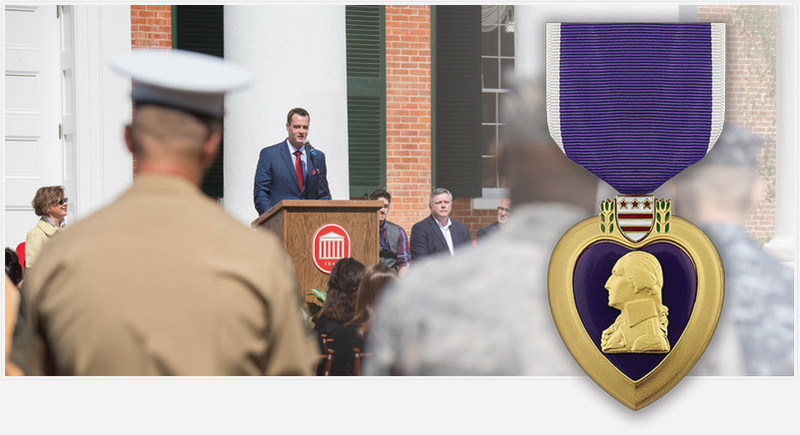 As military veterans arrive on campus, the University of Mississippi—one of only four SEC institutions designated a Purple Heart Campus by the National Military Order of the Purple Heart—welcomes them with resources and assistance. Created in 2013 and currently supporting 1,300+ student veterans, active members of the military, and their dependents, the Office of Veteran and Military Services recently highlighted a special population of veterans while addressing a common complaint of all students—parking. During a ceremony on the Lyceum steps in April, Don Zielenski, a student veteran majoring in psychology, received the first Purple Heart Parking Pass. New initiatives are bringing student veterans into leadership roles on campus, integrating them into the community, and offering needed services and resources. A Veterans Treatment Team, the first in the Southeastern Conference, provides a team-based approach to free healthcare for student veterans, eliminating the need to take time off from class and work to travel to the nearest Veterans Affairs facility. In the Veterans Writing Group, students share stories, critique poetry and prose, and find a new creative outlet for war and service. “The cathartic experience of writing helps students work through their experiences in service; the group has molded itself into a form of group therapy,” said Newby. The nonprofit organization works on complex issues surrounding veterans in higher education. Their My Ole Miss Wish initiative gives military children special experiences in partnership with Charter Road Hospitality and Ole Miss Athletics. For example, Colton Bullock, who has acute lymphoblastic leukemia, was inducted into the Student Veterans Association as an honorary member, took the Walk of Champions through the Grove, and rode to Swayze Field in a fire engine to participate in batting practice with the baseball team and throw the first pitch for the Military Appreciation Game against LSU. The Veterans Resource Center provides space for study, relaxation, community building, and programs with university representatives and others. Funds for furnishings came from the College of Liberal Arts, Army ROTC Alumni group, a College Alumni Advisory Board member, Coleman Funeral Home, the Center for Student Success and First-Year Experience, and Oxford’s Volunteer for Veterans. Three College students are among the SVA members who use the Resource Center. Briana Oderkirk, a history major and Marine Corps veteran, is social media chair for the Student Veterans Association. She plans to attend law school after graduation and to work with veterans throughout her career. Don Zielenski, from south Texas, was stationed in South Korea in 2008 before deploying to Afghanistan in 2011 as an Army Calvary Scout. He was awarded two Purple Hearts and a Bronze Star Medal with Valor. Veteran and Military Services will host a Veterans Alumni Weekend on November 2–3, 2018, with a Veterans Alumni Gala to raise funds for scholarships. It will feature Will Jimeno, the Port Authority police officer who was trapped in World Trade Center rubble for 13 hours and one of only 20 survivors. To learn more about veteran and military services at the University of Mississippi, visit https://vms.olemiss.edu/. To support our veterans, contact Andrew Newby, andrew@olemiss.edu.